I don't know why, but finding the perfect bathing suit was a difficult task this summer. 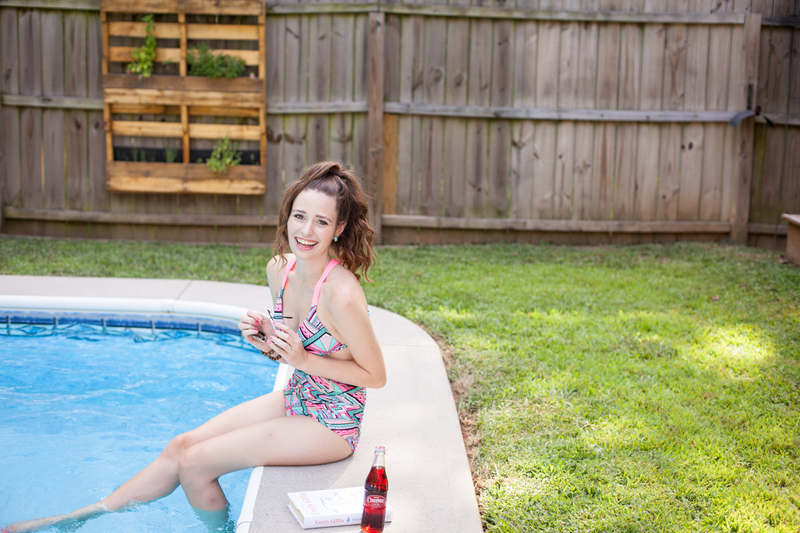 I've always enjoyed shopping for swimwear in the past, but I am taking a little while to warm up to all of the new trends that are big for this season. After my tried and true swimwear styles weren't my favorite for this year though, I decided to mix it up and try some newer styles. I have never worn a high waisted two-piece bathing suit before this one, but I think now I'm converted! High waisted bottoms have an added modesty factor, and now that I've tried them I think they also have a unique slimming effect! I also adore the bright and fun pattern of this colorful swimsuit. Summer is the best time of the year to wear eye-catching colors, and this swimsuit just screams "summer fun". These few photos are a very special sneak peak of a styled photoshoot that I did with Deeana of Deeana Kourtney Photography, who has been Southern Belle in Training's head photographer since I graduated college a few months ago! I had this bathing suit that I had been wanting to shoot, and we were able to build a whole fun photoshoot around it. The rest of the shoot features some fun cover-up looks, as well as some adorable props. Please go to Deeana's photography blog to check out the rest of the photoshoot! I'll be sharing the photos here on my blog at a later date, but go give her own blog a look for me, and don't wait to see the rest of the shoot! Lastly, today I finally head to Charleston to attend the 4th Annual Blog Societies Conference! This is my first time attending a blogging conference, which was on my personal blogging bucket list for 2016. I have been a member of The Southern Blog Society (what Blog Societies was born from) since 2013, so I am thrilled to be finally get to meet so many of the other members, and also reconnect with many other blogging friends! And to visit a beautiful Southern city that I've never been to before. I do have a prescheduled blog post for tomorrow- but be sure you're following me on social media (@miss_alk on Instagram and Snapchat, @rainbowflash94 on Twitter) to keep up with my adventures at #TBSCon - I'm sure this will be a trip to remember! You look great in these! Have so much fun in Charleston! Love that fun print! Have fun in Charleston! Very cute!! I love new suites for summer!! Have such a great time at the blogger conference! I am sure you are going to make so many wonderful blogger friends. That bikini looks adorable on you and HELLO perfect mermaid curls! I love that suit its so cute!! I hope you have the best time and learn lots. What a cute swimsuit! I love the cross back! You're the cutest ever and this suit is amazing on you!! Loving your hair in the high pony! These photos are adorable! I LOVE that suit, too! So cute! I love that bathing suit! I typically don't go for high waisted bikinis but this looks adorable! What a fun swimsuit! i think its so great that high waisted swimwear has become a "thing" again. And you definitely look great in it! That suit looks great on you, I am really loving this high waisted trend this summer. Ok. I am obsessed with that bathing suit. Such a fun print. You look amazing!